Southwark and Vauxhall Water Company was formed in 1845 on the merger of the Southwark Water Company and the Vauxhall Water Company. The reservoirs covered nearly 18 acres of ground which now houses Battersea Power Station. Steam engines were used to pump water to a height of 175 ft to supply Brixton. in the worst condition in which it is possible to conceive any water to be, as regards its animalcular contents. 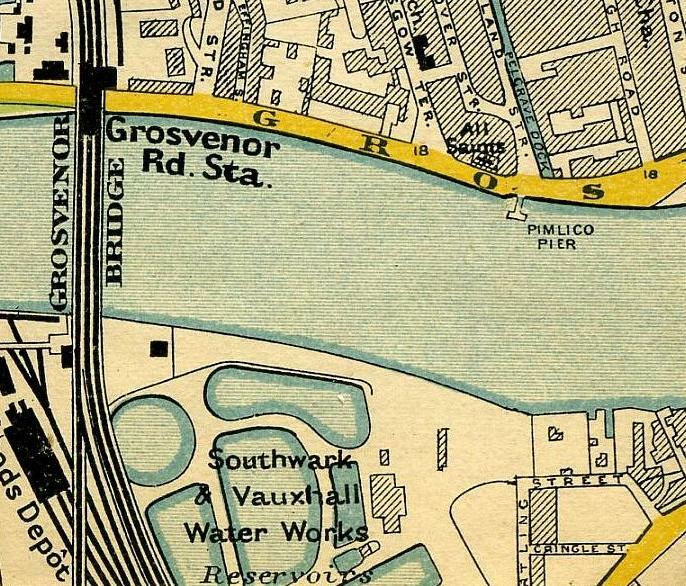 …A curious fact in connection with the water of the Southwark Company has been mentioned to me by Mr Hett, Surgeon of Bridge Street, viz: …that a gauze bag tied to the tap of the water cistern is found at the end of a few days to contain a mass sufficient to fill an eggshell, consisting principally of the hairs of mammalian animals. Of the Vauxhall Water Company’s supply, Hassall wrote, ‘It is water the most disgusting which I have ever examined. When I first saw the water of the Southwark Company, I thought it as bad as it could be, but this far exceeded it in the peculiarly repulsive character of living contents’. The 1852 Metropolitan Water Act forced the joint company to build new works at Hampton in 1855. The Company was taken over by Metropolitan Water Board in 1902.